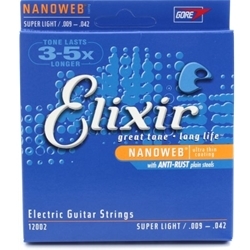 Elixir 12002 Nanoweb Super Light Nickel Plated Steel helps guitars sound their best and for a long time.. The engineers at Elixir took their original Polyweb coating and shrunk it down to Nanoweb size. The result? Brighter-sounding electric guitar strings that last 3 to 5 times longer than regular strings. In addition to an ultrathin grunge-resistant tubular coating on the wound strings, Nanowebs now have a revolutionary Anti-Rust plating on the plain strings to extend their life too. Elixirs are the first major innovation in guitar strings in over forty years, and they deliver what they promise: great tone and long life no matter what you put them on or how often you play.